Marketing involving the use of a smart phone can be superficially defined as mobile marketing. In a broad aspect mobile marketing can be defined as any marketing activity performed using a global network where consumers are connected through a mobile device, which we call as smartphone. Mobile marketing provide the promotion related information of any product sent on the mobile phone of the user which will be time a location oriented. Mobile marketing involves the use of sending the ads on mobile devices, including smartphone; tabs etc. and all these ad campaigns will be different based on the different applications where the ads will be initiated. All the apps provide their own unique and tailored options to make the ad appear properly. Mobile marketing is currently the best and reliable tool as the ratio of consumers using smartphone is constantly increasing. It is a permission based service where to start the ad contact numbers will be required which if are opt-in will be good to deal with but if purchased will make your ad spammy. It is initially difficult to make consumers subscribe willingly. So, first to start with we need to broadcast a message containing offers, rewards and to avail it the readers need to subscribe first and this is how you may grow your subscriber list. Marketing making use of cellphones by sending SMS (Short Message Service) started and grew in early 2000s in Europe and some parts of Asia. It became the most practices marketing channel to interact with more end users to generate profit. SMS became the most reliable and genuine way of marketing unlike email. A list of rules and conditions are created, to be strictly followed where you can send the sms only to your opt-in list instead to purchased one. This helped avoid spam practiced by companies. Short code, long codes were used to send these sms, which was unique for each user. SMS promise approximately above 90% open ratio and response as it contains only inbox not spam-box. This feature promise a good profit and higher subscribers. 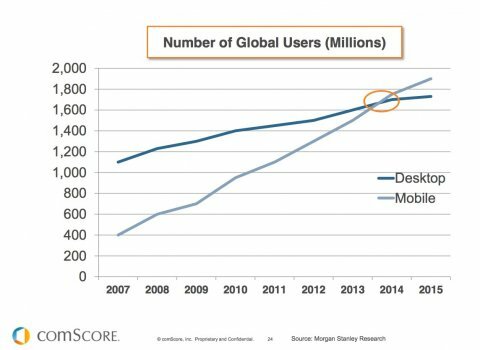 As per the graph results mentioned above the number of mobile users specially smartphone in the year 2014 grew more than the desktop users. This makes sure that using SMS ad will let you contact more people and the number of sms read will be higher than the number of email opened by the subscribers. Sharing images, text, audio, video is easy on smartphones, tablets etc. Multimedia Message Service gives a opportunity to the companies to share their product advertisement using MMS services. All the companies can use the MMS Application to person service to send and receive the MMS. Sharing images, video, and audio is more interacting than a simple text sms. 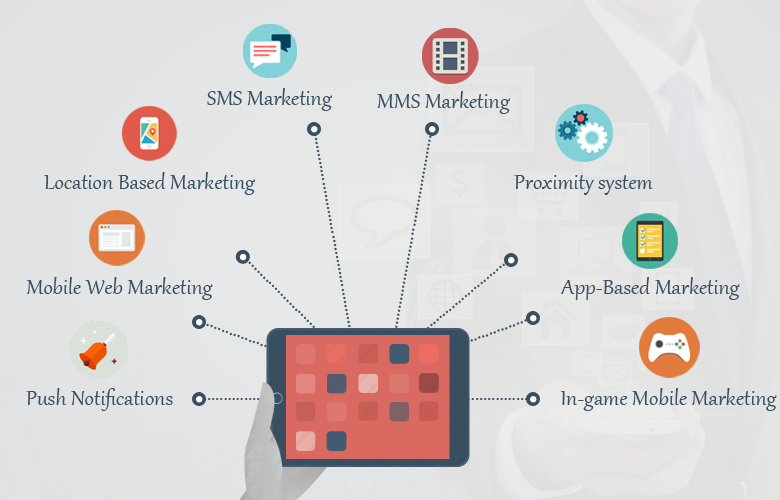 The next pace after SMS and MMS is the applications designed dedicated to a brand. These applications will be some paid and most free which can be easily downloaded in the smartphones, tabs. This will be a kind of mini-website or mini-interface, which you may run on your mobile device easily as on desktop. These apps allow direct interaction, payment and advertising. This simply is a method to share your ad messages to your subscribers based on the location. The location can be tracked through the GPS chip in the mobile device and like this, ads can be shared containing area-wise offers. Generate a web pages and web forms design, which is perfect to be viewed in the mobile defines mobile web marketing. Every provider has setup its own instructions to generate a design perfect for a smartphone. This generates the option to view services, purchase goods and hence grow the communication with your subscribers. With growing technology the demand for richer games in increased. The brans insert their banners, ads in these games or integrate the complete game in their application to drive the crowd and grow the subscribers and hence the profit. This can be compared to Facebook who have integrated a lot of game in it to grow the signups just to play the game and keep the traffic growing. This is a system developed and used by Apple where whenever a message is received it appears on the screen as a notification. With the applications generated by the brand this feature is quite useful in order to keep the user updated about the new offers, coupons, new stock etc. Keep your subscriber engaged and up-to-date about all new introductions in your application. This makes the promotion an easy way. Proximity system helps the brand to track the user and send the sms as containing information in a certain close geographical area. This required the use of GSM which then defines the SMS-CB (Short Message Service- Cell Broadcast). Through this GSM based SMS-CB the brands target their subscribers in the decided near geographical area and broadcast the sms when the mobiles are tracked nearby. This is a good system of sending the ad sms to drag the attention of the subscribers. Being multimedia, ads can be shared using text images, audio, video etc.